University of Maryland, Baltimore, Md. Private Collection. University of Maryland, School of Medicine Administration Building, and Dentistry, Pharmacy and Hospital, Baltimore, Md.. Private Collection. Notes: Medical College Bill passes Legislature (December 18). Notes: Legislature grants a lottery of $40,000 for the benefit of the Medical College, afterward increased to $1000,000. Notes: Board of Regents of Medical College meets and organizes with Dr. George Brown as President, Solomon Birckhead as Treasurer, and James Cocke as Secretary. Dr. Davidge elected as Dean of the Faculty. Seven students this session (December 28). 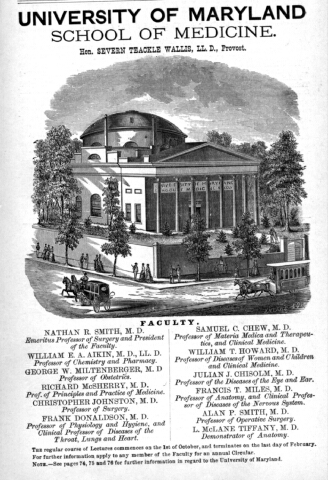 Notes: First public commencement of Medical College; 5 graduates. Notes: Class of five graduates at the Medical College; these are the first graduates whose names were published (May 4). 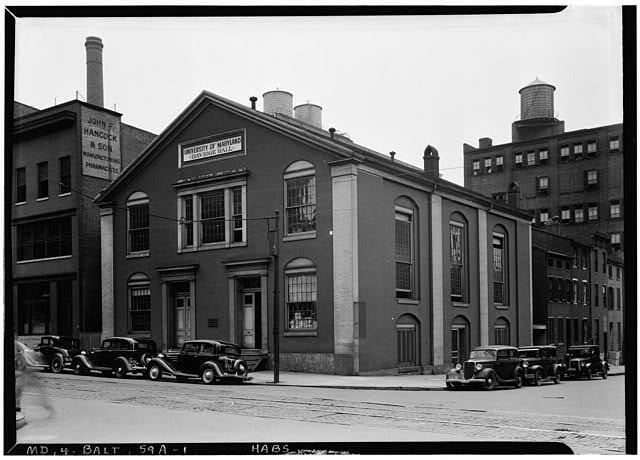 Notes: Medical College building on Lombard Street begun (May 7). Notes: Act founding University of Maryland passed by Legislature (December 29). Notes: University of Maryland organized (January 6). 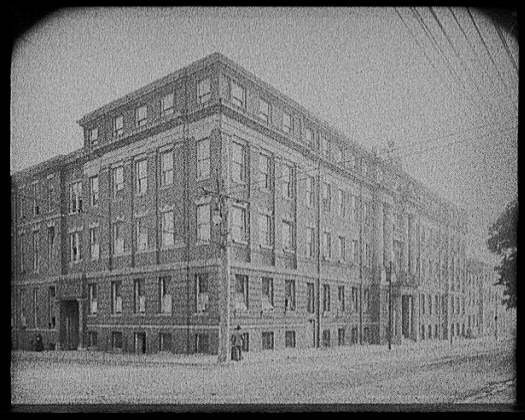 Notes: The building on Lombard Street partlyoccupied during this session (April 22). 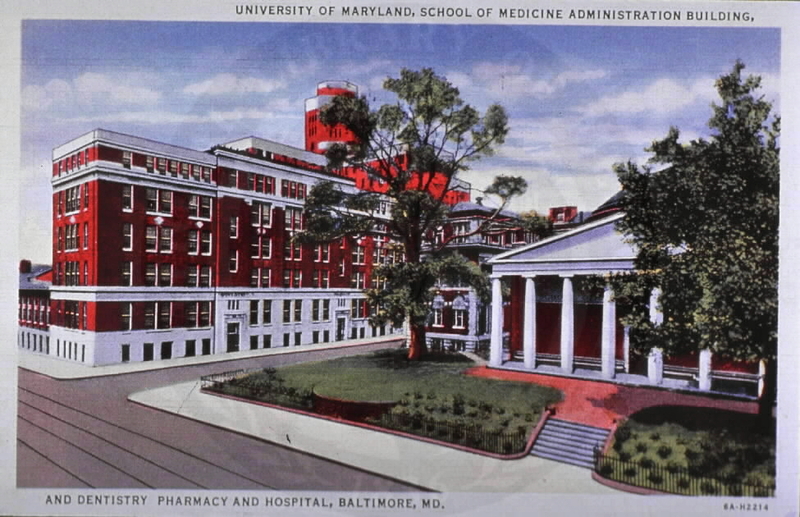 Notes: The Faculty of the University of Maryland purchases Dr. Crawford’s medical library from his widow (November). Notes: Legislature grants lottery scheme of $100,000 to Drs. Davidge, Potter, Baker, Gibson, McDowell and DeButts for benefit of the University (January 16). Notes: Notice mentioning reputation of school and two hundred students attending lectures. Notes: Fifty four graduates at last commencement. 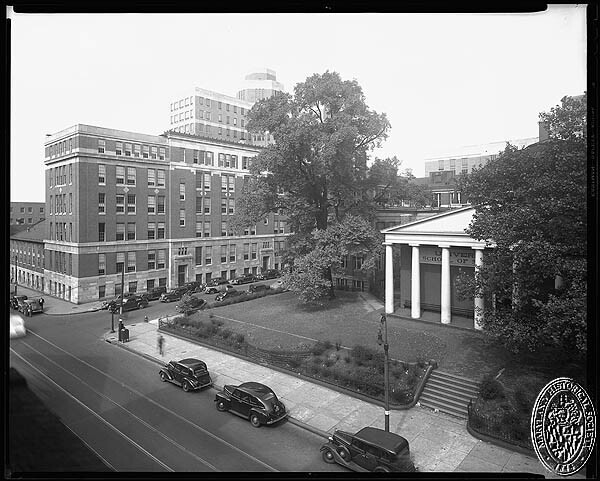 Notes: University of Maryland.—Situation at the corner of Greene and Lombard streets. The building is formed on a classic model; the portico, is supported by eight Doric columns. 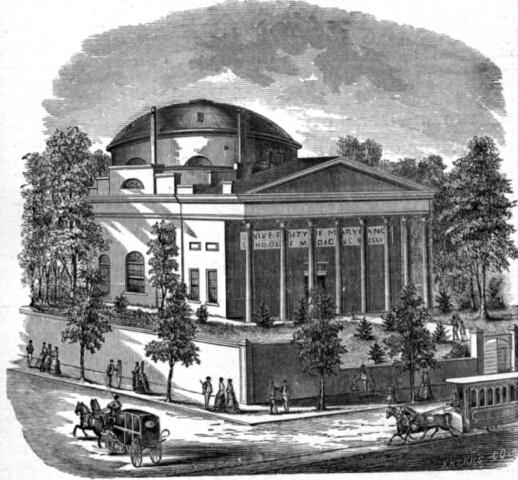 It has a dome surmounting a rotunda, 60 feet in diameter. This institution has four faculties, viz. Divinity, Law, Physic, and the Arts and Sciences. 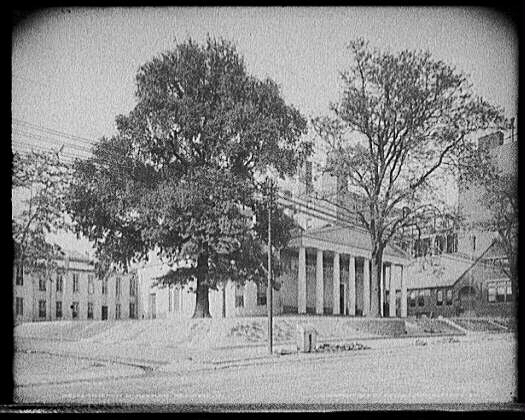 To this University is attached the Baltimore College, and Baltimore Infirmary, which see. 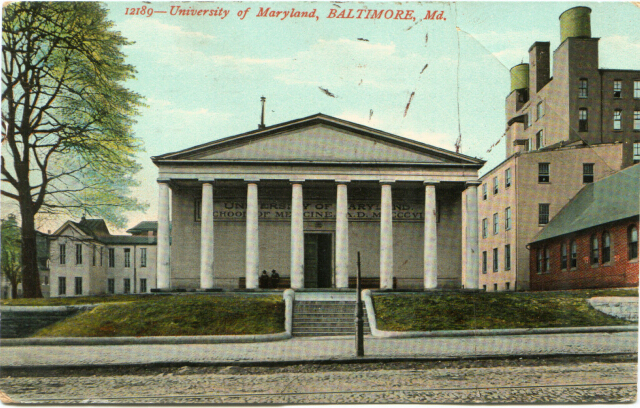 The University of Maryland was incorporated A. D. 1812. Notes: University of Maryland. — The introductory lectures in this old and established institution commenced on Monday evening, the opening lecture being delivered by Professor Smith. The several professors will follow, each delivering a lecture until all have presented their introductory. We understand that the prospects for a large class this session are highly flattering. 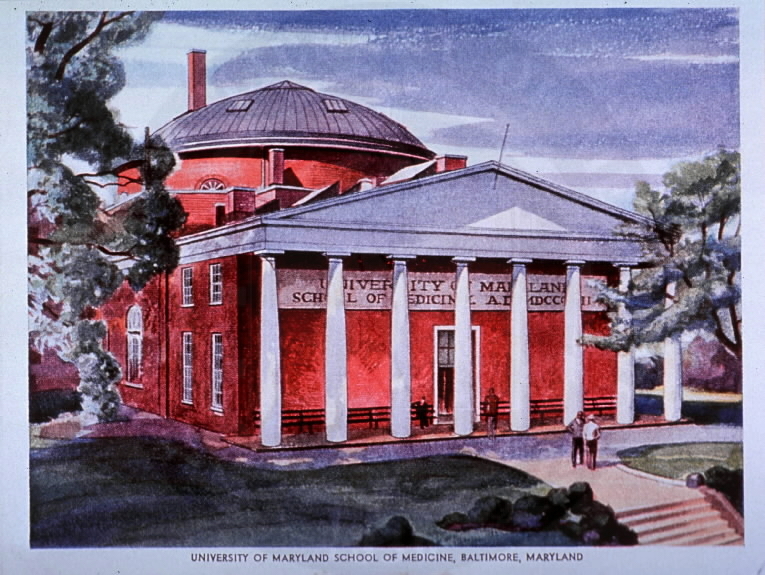 Notes: UNIVERSITY OF MARYLAND SCHOOL OF MEDICINE. Organized 1807. 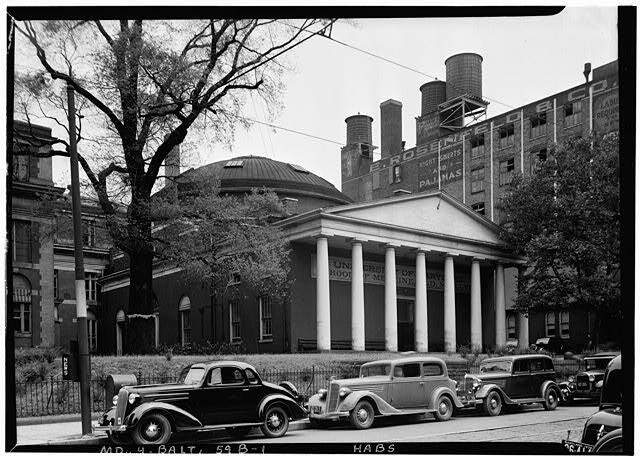 Essentially an independent institution with a University charter, though nominally the medical department of St. John’s College (Annapolis). Teaching staff: 61, of whom 24 are professors, 37 of other grade. Resources available for maintenance: Fees, amounting to $44,530 (estimated), out of which dividends are paid to the faculty and a large mortgage debt carried. Laboratory facilities: Good undergraduate laboratories adequate to routine teaching are provided in two poorly kept buildings for the following subjects: chemistry, physiology, including physiological chemistry and histology, pathology and bacteriology. Anatomy is poor. There is a small museum. In a separate building is a large and interesting library, but it is open only two hours each day. Clinical facilities: The school controls its own hospital, opposite the laboratory building, about 140 beds being available for teaching. The hospital records are well kept, senior students who pay for the privilege serving as clinical assistants. A separate maternity ward furnishes obstetrical work in abundance. The dispensary is large, properly equipped, and well kept. Date of visit: March 1909.